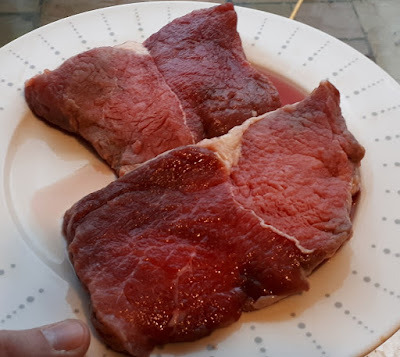 I got two beautiful steaks out the freezer, from a whole cow I home butchered last year (the cow wasn't from my land - it's a long story I might tell you about one day - but lets just say I ended up with a lot of beef!). I let them defrost and thought about the homemade wedges, fresh sweetcorn and fried onions I was going to cook with it. Trouble was after I popped the oven on and started to prepare everything else I could smell something not quite right. It wasn't strong, just a little whiff when you held your nose to it. Freezer burn on my steaks. I wasn't willing to risk it, time to cook something else. My wife got in from work and excitedly asked about the beautiful steaks on the counter, only to be told she was having a veggie curry instead! Now the meat has been in there 18 months and we're getting very near to the end of it, but it's a shame that some has been wasted like this. I hate food waste and I don't want to make these mistakes again. I frequently butcher animals for our own consumption and have three freezers with meat and veggies in to make sure we are eating as much of our own produce as possible. I tend to separate the meat into different freezers so I know what to use and what each is (at the moment one has mutton and one has lamb, etc). With 19 chickens to process soon , they're going onto pasture tomorrow hopefully, I want to package them in the best way possible so there won't be anything wasted due to storage. and I'm thinking of something better than just a freezer bag like I've been using. I was looking at vacuum packers and thought that this might be great way to improve my long term storage, I could use it for packing my chickens before they go in the freezer and for storing my dehydrated fruit and veg. I've also been told it's great for just keeping things in the fridge fresher for longer, then there's the possibility of Souve cooking or marinading meat overnight. So does anyone out there use a vacuum packer before they freeze meat? What one would you recommend? And do you use it for anything else? When we had one, it was in use mainly for freezing. When we came home from abroad, couldn't find the bags easily. The sucker broke eventually and we never replaced it. Great machines though. I know the directions say to prefreeze the meat but I've never done this as I don't have the extra room. I would not trade mine for the world. Yes the bags cost a bit but protecting all of your hard work is worth it. My unit is wide enough that I can bag a whole duck or roasting bird. Hi Kev. We usually end up feeding any many that's been in the freezer for over twelve months to the dogs and cat. I find there are some cuts of meat like tail end which aren't very nice. any many? Any meat even. Sorry! At risk of being repetitive.... It is the bag material that makes the difference. The vacuum is a 'nice' extra benefit. Ordinary poly is permeable to air, the plastic the vac bags are made of isn't. This is the primary reason things keep better in vac bags. When we put our chickens in the freezer, we use ordinary poly zip-seal freezer bags first. They are easier to deal with when stuffing in a wet chicken. Then, after the meat is frozen, we seal inside a vac bag. The meat is much better for much longer this way. Good luck! For us we have sealed mainly Salmon and smoked Salmon and some steak and it keeps well for several years . Good luck and have fun! ..the only other hint I'd have is keep the bag level and not pulling on the machine ..I place a folded up towel on the table and rest the bag being sealed on that.. it helps the bag sit still while it vacuums and seals. and once you realise the margins you need to make a good seal then measure the bags (if you are making them from a roll) with care ...it makes a difference to amount used. The Vacuum pouch company, has good prices on larger packs of bags, I often use a bit bigger bag than is needed and buy only one or two sizes. You can use them a second time, providing you dont cook in them. I have an Andrew James vacuum sealer, fairly cheap but so far fine. If you place meat or fish in a flimsy polythene bag first,then into the vacuum bag, no moisture will be pulled into the machine. We have a foodsaver brand vacuum sealer and we use it for vegetables and meat, I wouldn't go without it. We actually wash the bags we freeze the meat in and reuse them for vegetables. That way we can use them twice. Wouldn't be without ours, but the bags can be pricy. We don't freeze the meat first, straight into the bag. We have had ours for three years now still working great, it came from Lidl.